It's hard to imagine Okinawa as a haven for ice skaters, but to the surprise of many, five talented young skaters recently participated in an international ice skating competition in Hong Kong, and each one placed in the top four competitors in his or her event! The Skate Asia Competition, hosted by the Ice Skating Institute of Hong Kong, was the playing field for about 1,000 competitors, and events lasted from Aug. 12 through 18 with many assorted events for all skill levels. Competitors came from Thailand, Malaysia, Jakarta, England, Singapore, and many other nations around the world. They competed against one another based on their level of ability, and it really is quite an achievement that five young skaters from Okinawa had such success in as large-scale an event as this was. Hanna Sweeney, Malia Sweeney, Caitlan Ruff, Fallon Ruff, and Shelby Murphy, with skate instructor Kandace Mackeen are all part of a team of ice skaters who practice regularly at the Southern Hills Sportsworld in Haebaru City. A few of the students have practiced skating for two years, but for Hanna and Malia Sweeney and Shelby Murphy, this was their first large-scale skating competition. 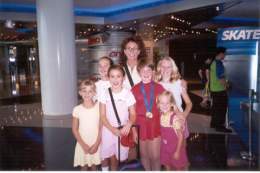 Caitlan and Fallon Ruff participated also in last year's competition in Hong Kong, and the group is looking forward to their next big chance in Bangkok, Thailand in 2002. The group hopes to bring more competitors with the team next year. Anyone wishing to polish his or her ice skating skills should contact the group president and founder, Danielle Plummer at 646-5837. Plummer, Mackeen, and Leslie Foppe work together to coach anyone interested in learning or improving their ice skating skills. Group lessons go for $10 per lesson, or if you would rather have one-on-one training, you can hire the coaches for private lessons for between $24 and $28 per hour. "Anyone joining this year can be in next years Bangkok competition," says Mackeen. Competition at this event will be based on skill-level, so if you are a little intimidated by the idea of going against an expert skater, don't fear! Beginners will be competing against other beginners, and experts will face1 other experts. "All the kids had a great time. They really loved it," says Mackeen. "Everybody was a little nervous, but this was a bonding experience for us. It was great." The instructors and coaches are available for lessons every day of the week, and lessons take place during open skating hours at the Southern Hills Sportsworld. You might find yourself improving at astonishing rate and taking the first place at the next year's competition. The coaches are open to training all levels and ages of individuals.